Anyways, on to some nail polish! Not many photos today, this one was a pretty simple one. I showed you ManGlaze ILF a few posts ago, today I will be showing you Mayonnaise topped with Hot Mess. Mayo is a white. Pretty obvious. Hot Mess is a silver glitter. All matte. (It's ManGlaze, that's all they do!) I forgot to take a picture of Mayo by itself before I topped it with Hot Mess. . .and also didn't put top coat on at all so no shiny pics, sorry! Kind of looks like foil. . .maybe less Hot Mess next time. In direct light. Really digging the matte! I resisted the urge to remove this, I honestly wasn't that fond of it at first. I am happy that I let it stay because it grew on me and I really love it now! I wish I had some stamping supplies because this would be a fun base! I meant to post this yesterday but time got away from me! I have something different on my nails now. . .I will post that either tonight or tomorrow for your viewing pleasure. :) In the meantime I want to share what I had on my nails this weekend! China Glaze Side Saddle was the swatch that caught my eye. SS is one of those colors that I think is easily overlooked in the bottle. . .I almost didn't buy it! But once it was on my nails I knew it was a keeper! Such a beautiful color but. . .
Look what happens once the sun hits it! So glowy! Of course it was time to add something else to it the next day! I didn't want to do glitter so I did some swatching of my different special effects top coats and Pure Ice Busted was a perfect match! Looks pretty much just purple and pink huh? But look at that color shift! This combination turned out even better than I expected. The color shift was amazing! And both of these are easy to find, inexpensive brands! I also have Pure Ice Heart Breaker and Oh Baby! which are also color shifting top coats. . .I will be giving those a try soon too! What to you think of this mani? Are they any polishes that you almost wrote off but ended up falling in love with it instead? The Nail Polish Guru 100 Follower Giveaway! Alright now on to some prizes! Those of you that follow me on Facebook saw my sneak peek earlier this week. . .now to show all of you! Jordana Glitters and more EOS lip balms! This giveaway will be open until until 3/24/12! You will earn 1 entry for following my blog via GFC and 2 entries each for liking my FB page and sharing this giveaway. I do verify all entries before choosing a winner so please don't submit any false entries, it makes me sad when I have to delete them. Good luck, ladies! Thanks again for all your support! I already posted about the wonderful ManGlaze ILF. . .but as wonderful as it was I can only leave my nails alone for so long before I am ready for something different. I have a ridiculous amount of untrieds due to my collection growing faster than I can keep up with. . .but I knew that I just wanted to add to my existing mani. Enter Butter London Knackered. Here is the description: A sheer, twinkling oyster shade flecked with micro glitter particles. This is from BL's Spring collection. Based on other reviews I knew that Knackered is fairly sheer and is best for layering. The blue flash in the bottle looked very similar to the blue in ILF so I figured they would be a great match. Definitely not disappointed! Check it out! For the life of me I could not capture the purple/green flash. But while I was laying in bed the following morning I managed to take a few pictures that really show the flash, just not the best quality photos, sorry! Loving duochromes more and more! I could not stop looking at my nails with all the duochrome-y, holo goodness! Do you have any colors from Butter London's Spring collection? I also purchased Disco Biscuit but didn't like it on me. I prefer warm toned pinks. I really want to pick up Slapper too, I am a sucker for teals! I am lucky enough not to have to return to work until Wednesday so expect to see more from me over the next couple of days! Hope you all enjoy your Saturday night! BAM! Look at what happens when you add a top coat! So shimmery! Like super fine holo glitter! What do you have on your nails this weekend? Do you own or will you be buying any ManGlaze polishes? Today I have another haul post for you. Sorry I forgot to take a photo of it all together! But it doesn't seem like I bought as much if I keep it separate instead of all together. ;) But I have over 100 polishes that I will be adding to my blog sale, so I don't feel so bad purchasing more! I have had my eyes on the HITS No Olimpo holo line and they were finally available on llarowe! There were also 3 HITS flakies I had been waiting to come back in stock and another a-england holo to complete my collection. Julep offered $20 mystery boxes as a Valentine's Day promo. I was hanging on to a a voucher that I purchased for $20 to get $40 worth of Julep product and I was able to use that towards the box! What a steal! I love the mystery boxes and am super lucky to have gotten one of the higher end ones! Included was lip gloss, nail growth revitalizing serum, nail appliques (not photographed), age defying hand brightener, top coat for hair (not photographed), cuticle oil, fast dry top coat, glitter pot and 7 nail colors! (Polishes only, top to bottom) Shania, Stella, Anne, Helena, January, Demi and Gwyneth. Butter London had a 30% off sale that I had to take advantage of! Perfect opportunity to add to my small BL collection! (L-R) Wallis, Dosh, Disco Biscuit, Victoriana, Henley Regatta and Knackered. I finally recieved my first order from Nerd Lacquer! Amanda had promised a special color to be included if the order was processed after her normal time frames so I was actually happy that it took longer than expected! Largo was the special color (get it?) and ended up being my favorite! Square glitter!! Not that all of her polishes aren't just as amazing! Her Etsy shop was recently restocked and I have more on the way that I will share with you next time! Amanda has temporarily closed the shop to get caught up on orders but she will be back soon! Another Etsy purchase, this time from the seller PamsAndKin. I love the colors she has to offer and that they are all 3 free! The final order I placed on Etsy was from Pretty & Polished. Keep checking her shop as she is in the process of restocking! :) These all have a beautiful holo sparkle! Okay, it's official. . .I am obsessed with ManGlaze! I just can't get over the names, artwork and the matte-ness that turns to glittery, shimmery goodness with a top coat! LOVE. There has been a lot of talk about Jordana Glitters, so I stopped by my local KMart and picked some up! At $1.99 each I didn't feel bad buying them all. Especially since they are $2.99 on Jordana's site and on cherryculture! Several weeks ago Good Morning America offered a special for 50% off these 3 Deborah Lippmann colors! The best part was that you got free shipping if you bought all 3! And finally more nail mail from my friend Savannah! OPI's Pirates collection had several colors that I loved but wasn't able to get my hands on. Savannah was able to find these for me on clearance at Ulta! Yay! She also sent me another beautiful Orly to add to my collection! What do you think of my haul? What have you hauled recently? Have you been able to cross any lemmings off your list? Look for my blog sale to be posted by tomorrow! Happy Monday! I hope you don't mind a couple posts today, I have some catching up to do! When my order arrived I was already wearing a-england's Dragon. (TS is more of a sheer turquoise on it's own) Sorry I forgot to grab pics of that before I layered over it! I couldn't wait to get Toxic Seaweed on my nails! But enough with the chit chat, on to the pictures! I will never get tired of flakies! Bottle shot of all the glittery, flaky goodness! I am so happy that I bought this polish! Get your hands on it while you can, this is a limited edition! Thanks for stopping by, I will be back soon! 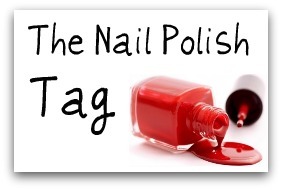 I was tagged by Melissa from Passion For Polish. for The Nail Polish Tag. Melissa is a new blogger as well, be sure to follow her page! 2. What is your favourite brand of nail polish? 3. Do you like crackle polish or do you hate it? I love crackle polish! I have a nice collection of colors and think it is a great way to spice up an existing mani. 4. What was your first nail polish brand? The first brand that got me really collecting nail polish was Sephora by OPI. I seriously ordered almost every color from their website before I expanded to other brands. When I was younger my first polishes were Hard Candy and Wet n' Wild. 5. If you are going to have a nail polish line, what are you going to name it? 6. What nail polish colours do not compliment you? 7.What nail polish colours do compliment you? 9. What was the best nail polish gift you ever received? My nail polish buddy in Texas, Savannah surprised me with China Glaze Ultamate Holiday and Fireside Glow! They were huge lemmings of mine! 11.What is your second favourite nail polish company? 12. Glitter or no glitter? 13. OPI, China Glaze or Essie? Up until very recently I only had 1 OPI in my huge stash. I have a large selection of China Glaze, I love the quality for the price. I only have a handful of Essie's, I am not super impressed with their selection of colors since I am not big on neutrals and they are lacking in the glitter department. 14. When do you change your nail polish? A couple of times a week. Sometimes I will just add something to a previous mani to spice it up. 15. What's your favourite colour on your nails? I love corals. So flattering and makes me look tan even in the winter! I own a lot of both, I really like bright colors but I also really like dark colors! Just depends on my mood and or outfit. 17. What are you wearing on your nails right this moment? I have been in the middle of swatching my collection. . .at the moment they are bare except for 2 nails on my left hand! ManGlaze Lesbihonest on my middle finger and ManGlaze Nawsome Sauce on my ring finger. 18. Matte nails -in or out? So in! I love mixing matte and shiny in the same mani. My go to use to be black tips with silver glitter separating the tip from the rest of the nail. Now I like to do the whole matte/shiny for a french or glitter on my tips or something else fun! Seasons don't determine the color I wear except during December I tend to stick with Christmas colors like red, green, silver, etc. I am so excited to share this mani with you! As you saw in my last haul post I placed an order from Jenna at Lacquistry. There were so many amazing glitters to choose from but Tepes stood out to me the most. Jenna's Etsy shop has just been restocked but act fast because her polishes will fly off the shelves! She has become well known in the polish world for a good reason! "I am reading The Historian right now which incorporates much of the true history of Vlad Tepes, or Vlad the Impaler. Bram Stoker loosely based his novel Dracula off of Vlad Tepes who ruled the Romanian city of Wallachia in the 1400's. His preferred method of punishment was impaling his victims so that they died a slow, agonizing death- many times from exposure to the elements rather than bleeding to death. A rather morbid subject matter for a pretty nail polish!" This is vamp with depth and an inner spark. Tepes is definitely one of a kind in my collection! So much beauty and depth! I had a super hard time trying to narrow down pictures, so you get to see several! Jenna, you are a genious! Look at all the glittery goodness in the bottle! Slightly blurred so you can see the different glitters. This stayed on my nails for almost an entire week. I used Cult Nails' Get It On base coat, 2 coats of Tepes and Cult Nails' Wicked Fast top coat. I was very impressed how easy removal was considering all the glitter goodness! Have you tried any of Jenna's creations? What indie brands do you love? What ones do you want to try? Cherry Culture haul. Mostly LA Girl, at $2.50 each I couldn't pass them up! I got a few from the Metal, Rock Star and Disco Brites collections but mostly from the Color Addict collection. I love the gold shimmer that runs through that entire collection! So flattering for my skin! Also a couple more Milani 3D holos and a LA Splash glitter. This is a combined photo of a few orders from Lean Ann at llarowe. More flakies from HITS and Ludurana! And lots of holo goodness!! I got some of the colors from a-englands The Legends collection and my first Glitter Gal!! Royal Mail! I ordered these babies directly from a-england in London during their 30% off promo! More holos! And look at that purple! Love! I used the rest of my Sephora gift card from my sister to purchase some more SOPIs. I was able to snag a couple of these at only $5 a piece! I also picked up a couple more Illamasqua polishes. I am so in love with this brand! The colors are so rich and beautiful! More Zoya! I got a couple of these from the 2 free just pay shipping promo that Zoya was so kind to offer. I had some spoon credit that I used towards the others. My camera refused to capture the true color of Lo, sorry! I can't believe I put off the other 3 for so long! These are going to be amazing for layering! Barielle had a Chinese New Year promo for half off all of their nail polishes! On top of a BOGO half off promo! So instead of paying $8 each it was $4 for the first color and $2 for the second! What a steal! This was a great opportunity for me to try this brand! Nail mail from my friend Savannah! This was actually the original package she sent me, but it got stuck in the mail and ended up coming weeks later! What a nice surprise though as we both assumed it was lost in the mail for good! Love that she chose some colors from OPI's Texas collection since she lives in Texas! I got a voucher for bloom.com for $40 worth of product for only $20!! Woo, half off! These are all new brands for me other than the OPI shatter from the Nicki Minaj collection. Love the POP bottles and I almost died when I saw the Megan Miller! How cute is that?! I love how the CND Effects instantly transforms black into something beautiful! SUPER STOKED about these ones! I had heard about ManGlaze before but didn't realize their awesomeness until I saw some posts from Traci at the Trace Face Philes. These go on matte but become a different animal with a top coat! They have this super fine shimmer, almost like tiny holo particles! I love the fun names too! I saw this set on a blog during the holidays and it became an instant lemming. But I wasn't about to pay full price for it, let alone the $50+ it was going for on Ebay! So imagine my excitement when it went on sale at Barneys! These are my first Deborah Lippmann polishes. EPIC! I plan on doing a side by side comparison of this and Finger Paints Asylum as they are rumored to be dupes. The only difference I can tell based on the bottle is Asylum has more of a milky vs clear base. Yes, I am a sucker for packaging! Thanks to Ebay for helping me cross a couple more lemmings off my list! Frankens have been the thing lately and I couldn't help but get sucked in myself! I don't plan on making my own but I am all about supporting those that do! There are some talented ladies selling their goods on Etsy! I placed my first order with Jenna from Lacquistry! I can't believe how awesome this color is! I couldn't wait to get this on my nails! Whew! I am in the process of reorganizing my stash, including weeding out colors to add to my blog sale or to use in swaps! The nail wheels are definitely making it easier with the added benefit of saving my cuticles! :) I have already recieved some AWESOME nail mail for February, I can't wait to share it with you! In the meantime I have a NOTD post coming up and am continuing to work on my blog pages and design! I am open to any and all feedback/suggestions, please feel free to comment!